The sun has gone for now but if you want more energy here’s a suggestion …..
” Stop thinking in terms of limitations and start thinking in terms of possibilities”..
What traits or actions make someone stand out as an expert in your eyes? Considering most of us work alone we can easily cruise work-wise and take what comes along. By slipping into second and third gear we can reduce ourselves to a go slow. There is a difference between a self-imposed barrier and one that is set externally. The barriers that we place there ourselves can significantly limit our ability to succeed. Yet we hold the power to remove the self-imposed barriers through our own action. To up our game we need to seek out people while still embracing neighbour’s and friends. By joining some industry networks and here’s a plug for joining a Boardroom we can continually seek out new peers.Doing bigger and better stuff that put more pressure on us to step up. Now in view of aspiring to reach at least two role models who are your top choices?. I am a ENFJ Carolyn helping individuals and businesses discover the simplicity, harmony, and freedom of being organized and productive. Posted in Business, Fitness, Health, Musings, Wellbeing | Comments Off on What traits or actions make someone stand out as an expert in your eyes? Which contact have you connected with through Nature?. I opened up my social media inbox and received this present, just in time for the weekend. The very best of Three Cliffs Bay, Gower Peninsula. Friday’s Cardiff Boardroom started with a short ‘light bulb’ exercise and a brief ‘phone link up’ with Tom Evans. That exercise continued to set the tone for the rest of my weekend. Someone who continues to inspire me to aspire is a twitter connection Alun Morris Jones, Gowerscapes and I was to meet him in person for the first time at Swansea’s small airport. In the week during a phone conversation with Tom Evans we talked about who were our influencer’s both past and present. For me past influencer’s of my professional life were Robin Wheway and Don Lewis now deceased (Dean at St. Mary’s Church). On Monday, I had attended the funeral of Robin, an English gentleman, who had been West Glamorgan’s Industrial Relations Officer when I first met him. Both he and his family became firm friends and Robin was one of my dearest professional and business referees. Following his service and listening to a poem his son had written, was an amazing tribute to a loving father and friend. 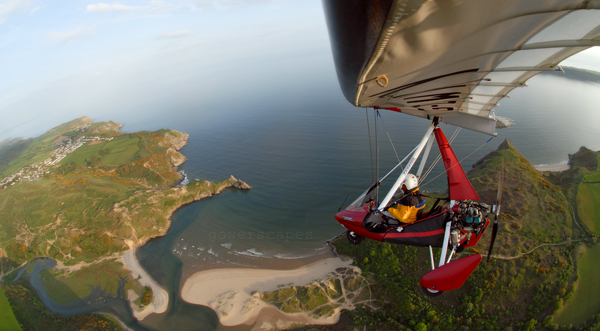 Linking past influencer’s and present took on an ethereal turn this weekend having had a amazing invite from Alun Morris Jones, to fly in his micro light over Gower, having first connected on Twitter. I logged on to twitter ( after members had left the Cardiff Boardroom ) to read this message from Alun ” Meet me at Swansea Airport at 8.45am Saturday and bring warm clothing?”. The ‘Woo Hoo!’ tweet took on another dimension when I woke early, feeling very excited, to gather warm clothing for what was going to be a glimpse of glistening heaven on earth. Driving over Fairwood Common, listening to Coldplay – ‘Every Teardrop Is A Waterfall’, I felt hugely emotional, as memories of my dad, scooting off to fly in a light aircraft from the same runway, came flooding back. Alun made sure I was warm, deciding it was best to put me into a red flying suit (his spare ) with gloves, helmet and radio link. Carrying out several departure personal and radio safety checks he took us off for what was to be my first glimpse of ariel/awyr heaven over Gower. Alun made sure we were in contact the whole flight through his radio and from that moment on I was in heaven, seeing miles of clean beaches, green lush agricultural fields, waving families and scoops of flying birds skim across the beaches. Alun had said I could fly the micro light and indeed pointing toward Oxwich I took over with a ‘Woop! Woop!’ and flew the beauty. The scenes, and views flashing past me like flashes of ethereal light. All this seen from relentless blue skies and feeling such admiration for this micro pilot swooping in and out, up and down around the coastline and then spending a little time over my favourite place in heaven on earth, Three Cliffs. Landing my spirit was equally as exhilarating in meeting a co micro pilot, aptly named Dai who had been filming us flying alongside every now and then. Listening to Alun relay to Dai was part of my experience in heaven on earth, even Alun’s introduction to Dai on air radio, encouraging him to ‘watch his language’ brought a huge smile to my face ( the mother of a Paratrooper Sgt.) I really do know where that line comes from ” He swears like a trooper”. Fighting for our freedom they frequently do. Then out came these fit young men The Red Devils from a car, excited and raring to take off and practice. So I stood to reflect and relaid the scene from my mobile to my son and daughter, sights I saw from the airfield ~ Excited young personnel willing you to “Jump with Us!” doing their parachute jumps, filling the sky with their multicolored chutes with incredible skill and precision. I did, I had been in heaven on earth, thanks to Alun Morris Jones. So who has influenced you in your business life? You are currently browsing the Lifestyle Online blog archives for July, 2011.